Continuing with my latest Etsy kick - today I'm highlighting a First Nations artist on Etsy. First up is Justin Rivard, a First Nations artist who has been engraving for nearly 20 years. Originally from Nanaimo, he now works in Vancouver. Rivard is represented by several art galleries in British Columbia and the United States, but he also enjoys selling his work directly through Etsy. His jewelry is clean and detailed, and he creates items such as earrings, moneyclips, bracelets, business card holders and cufflinks. Starting at the 'lower end' (financially-speaking), these sleek, wearable dangle earrings are hand-carved by Rivard. 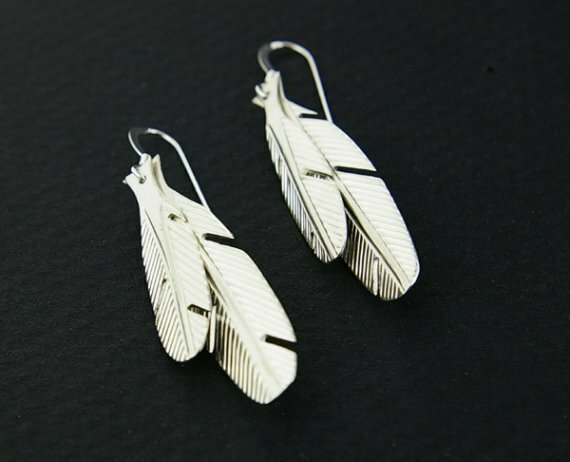 They represent Eagle Feathers, and measure 1 1/2" x 3/8". $70. These baby bracelets measure 3/8" x 4 1/2" and make for cute gifts for the lil ones in your life. There is also space on the back to have the bracelet engraved and personalized. These bracelets are hand-engraved by Rivard, and can be completed in symbols ranging from Hummingbirds to Orcas. Click here for more info. $125. 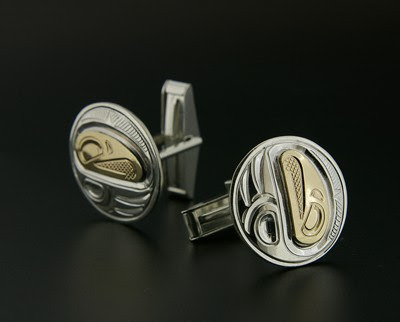 These distinctive and unique cufflinks are hand-carved by Rivard with symbols that represent family crest designs found in Northwest Coast Native cultures. Rivards states that these cufflinks make great gifts, especially for the men in your life who are difficult to buy for. They can be engraved with the Orca or Eagle design. $280. Click here to see more from Rivard, and his shop, Art From Above. Thank You for this Beyond Buckskin page I love it. I have gotten the Native American fashion bug but I wanna only buy Native American made products. I spend hours trying to find good sites and now after reading your article I've found many great sites, Finally!! Thank You. I got my love of Native American's from my Mom. But I really wanna learn more about the Native Culture & history,they don't teach you enough in High School. Hopefully I'll be able to support them by only purchasing Native made crafts. Thank You for all your wonderful & very informative articles.